Made up rebar fitments for forming cages to increase the compressive strength of reinforced columns and beams. Also they contribute to accurately positioning the main reinforcing bars. 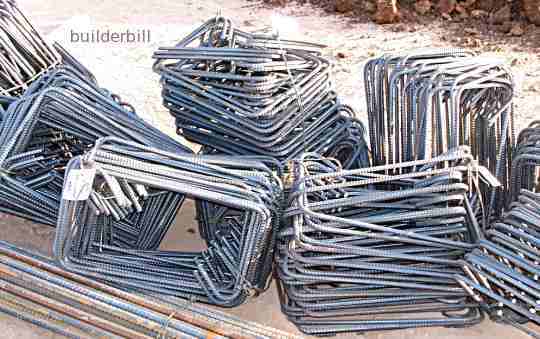 Concrete rebar ligatures: Bundled and tagged from the supplier. Concrete rebar ligatures: Used here to make up a foundation cage for a lamp pole with the Gal. HD bolts included. The stack of ligatures above have been made to a schedule and it is important that they be checked and measured for accuracy before they are assembled into beam reinforcement and fixed in position. On the right is a circular cage that has been tack welded together. Welding should be kept to a minimum in any rebar steel. Heating the modern types of bar can be done, but to retain the full strength of the bar it should be kept below 600deg. Ligs are used in columns of course and circular columns quit often us a single bar as a lig that is rolled into a spiral. Reinforcement for smaller beams is made up like the one below when it can be lifted into position by a couple of men, but larger suspended beams soon get complicated and they are mostly made up in position on top of the soffit formwork, quite often before the beam side formwork is fixed. Concrete ligatures: Being used to make up reinforcement for a small footing beam.